A case with acute intravesical haemorrhage with obstructed uropathy is very challenging to diagnose during antenatal period, especially during labour. Here we are reporting a case with intravesical haemorrhage with obstructive uropathy in antenatal patient. Aim of presentation is awareness of this condition which is often difficult to differentiate from uterine rupture in obstructed labour. It can be diagnosed with emergency ultrasound if we had kept a differential diagnosis. We are describing a case of 29 year un-booked female G₃P₁₊1₁L₁ at 35+1weeks of gestation, illiterate of low socioeconomic state reported to labour room in gasping condition. Before reporting to us she was getting treatment from some untrained person and details of which are not available. She gave history of increasing pain abdomen for 2 days followed by cessation of pain &fetal movements for 6 hours. She also gave past history of urinary incontinence for 2 years and on treatment by some untrained person at peripheral centre. On examination patient was in irritable and having difficulty in breathing. Her Pulse rate was 110/min, BP-100/60mmHg, gasping with severe pallor. On per abdominal examination, two obvious abdominal lump seen with distinct gap in between as shown in Figure 1. Per vaginally os could not be felt. Fetal heart sound was absent. USG facility is not available in labour room. Patient was in respiratory distress and pallor was present. Intavenous fluids started. Catheterization was done and there was frank haematuria. Injectable antibiotics ceftriaxone, metrogyl started. Blood was arranged. Counselling and prognostication was done. Our provisional diagnosis was ruptured uterus in obstructed labour so we planned for urgent laparotomy under General anesthesia. Per operative tense distended bladder (15×12cm) in front of uterus as shown in Figure 2. Lower uterine segment could not be reached 500 ml urine aspirated. This aspirated urine was blood stained as shown in Figure 3. Fetus was old IUD (Intrauterine Death) in transeverse lie. Atonic postpartum haemorrhage occurred. Bilateral uterine artery ligation & B-lynch suture done. Bladder again got distended in per operative period. Urosurgeon was called and he opened the bladder by giving incision and we saw that a big clot was inside bladder and around 500cc blood clot was evacuated from bladder. 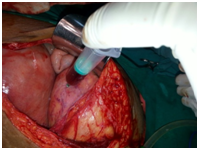 Suprapubic catheterization was done along with continuous bladder irrigation. Two units of blood were transfused. After surgery she could not be ex-tubated because she was not able to maintain saturation. But there was no bed available in ICU. So patient was kept on bag and mask ventilation. Later on patient brought USG report showing bilateral hydro-ureteronephrosis with 8.5cm mass at urethral opening. Urea-208, Creatinine-12 Hemoglobin-9. She expired after 24 hours of operation due to ARDS and acute renal failure on chronic kidney disease with anaemia with septicaemia. This patient died because she was referred late and already in septicaemia and her history and examination misleaded in diagnosis. USG Facility was not available in labour room. In this case, we cannot differentiate between intra-vesical haemorrhage from ruptured uterus in obstructed labour because of typical history of pain abdomen and two distinct lump as seen in obstructed labour. After catheterization frank haematuria was present. It misleaded again for rupture uterus. Intra-vesical clot is very rare and we could not think that it could be due to clot in bladder . Sometime patients with plcacenta percreta can also present with haematuria . In this part of India rupture uterus is very common because women try normal delivery from untrained dais with no proper back up and proper transport facility is not available. Timely referral of patient is not there. Because of poverty and illiteracy people go to untrained persons and when patient is about to die and left with no money it is referred to a tertiary care centre. These centres have so much workload that many times bed is not available in the intensive care unit. If the diagnosis was done with USG then so many treatments are available for intra-vesical clot [1,3,4]. Whenever a patient with history of cessation of labour pain with haematuria with pallor comes, we should first think of ruptured uterus in obstructed labour which needs emergency laparotomy. But we should take detailed history and examination and investigations to confirm the diagnosis. We should kept some bladder pathology as differential diagnosis. Urgent USG facility should be there in labour room so that proper diagnosis can be done. The aim was to make aware that sometime this type of condition can mislead us in diagnosis. Korkmaz K, Sahin H, Islim F, Bircan Z, Inci I (1996) A new treatment for clot retention: intravesical streptokinase instillation. J Urol 156(1): 201. Gupta P, Pradeep Y, Goel A, Singh R (2012) Hematuria: an unusual presentation of placenta percreta. Urology 80(2): e13-e14. Bandari J, Dangle PP, Tennyson LE, Correa AF, Cannon GM Jr (2015) Large bladder clot-An unusual presentation of neonatal bilateral renal vein thrombosis-case report and review of literature. Urology pii: S0090-4295(15)00695-0. Bo J, Yangyang Y, Jiayuan L, Sowen D, Yong C, et al. (2014) Evaluation of bladder clots using a nonsurgical treatment. Urology 83(2): 498-499.